When the Animal Kingdom opened, Disney banned plastic straws from the park. They didn’t want to take a chance that one of these potential hazards might find its way into an animal enclosure. Last month, Disney modified this policy. It is now possible to get a straw at the Animal Kingdom, but instead of plastic, … Continue reading "Good News for Straw Lovers"
Sometimes it’s hard to finish a trip report once home, but here is the conclusion of my late October adventure to WDW. In case you missed the earlier posts here are the links: Heading to Walt Disney World Magic Kindgom Friday Part 1 Magic Kingdom Friday Part 2 Segway Saturday Part 1 Segway Saturday Part … Continue reading "Sunday at the World"
This was Challenge #12: And here’s the answer: Copyright Â© 2007 Barrie Brewer, Nikon D50/18-200VR, 1/500s shutter, f8 Everyone’s a winner! There were more responses than ever to this week’s challenge and everyone knew that the photo was taken in front of the France Pavilion in Epcot. Jennifer Snapp was the first one to send … Continue reading "Focus on Disney World – Where in the World? #13"
Copyright Â© 2006 Barrie Brewer, Nikon D50/55-200, 1/500s shutter, f4.4 One thing I love about taking photos of the parades at Disney World is that the Cast Members love to mug for the camera. It makes it so fun to take their pictures. This is one of my favorite photos. It was taken during Mickey’s … Continue reading "Focus on Disney World – Portrait Composition"
The Rule of Thirds is a compositional rule in photography and other visual arts. 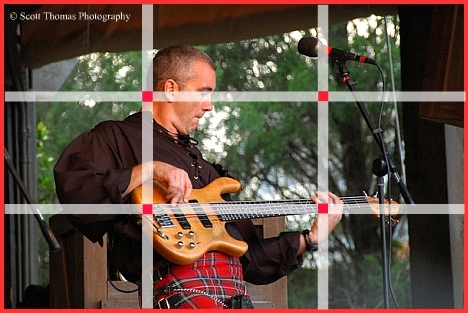 The rule states that an image can be divided into nine equal parts by two equally-spaced horizontal lines and two equally-spaced vertical lines. The four points formed by the intersections of these lines can be used to align features in the … Continue reading "Photographic Innoventions: Rule of Thirds"
Walt Disney World – What’s New? New to us, that is – since we haven’t been here since last December. That’s one of the things we really enjoy about Walt Disney World – it seems like every time we’re here there’s always something that’s new, whether it’s a new attraction or exhibit or live entertainment group. Contrary to what you might … Continue reading "Walt Disney World – What’s New?"